These days we take female police officers for granted, even if they still don’t have the same status and representation that male officers have. These days we take the legal rights of labor—to organize and strike—for granted, even if management doesn’t always respect those rights. 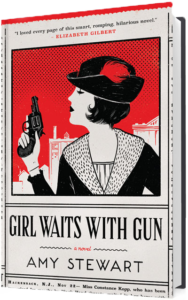 In the Chagrin Falls Library, a title caught my attention: Girl Waits with Gun. 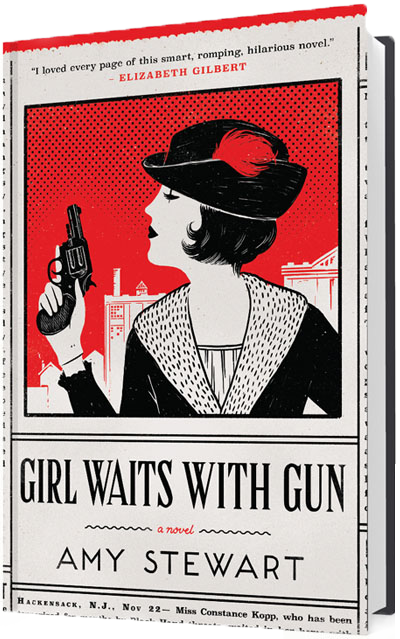 I read the book flap: “… based on a true story of one of the nation’s first female crime fighters.” I was hooked. Constance Kopp lived on a farm on Sicomac Avenue in Wyckoff, N.J. and had a year-long run-in with a Paterson silk-mill capitalist in 1914-1915, during the aftermath of the famous 1913 Paterson Silk Strike. By that point I had to read it: I grew up halfway between Wyckoff and Paterson. My grandparents lived on Sicomac Avenue during my youth. My father was born in Paterson in January of 1915. Would the book be worth the read? It definitely was, and not just for an NJ ex-pat. Amy Stewart has fashioned a fine novel fleshing out the historical facts of this amazing story. In a situation still simmering from the silk strike of 1913, with all its strike-breaking violence—remember, organized labor did not have legal protection until the Wagner Act was passed during the Great Depression, twenty years later—Constance Kopp and her two sisters persisted in demanding that a silk mill owner pay for the damage caused by crashing his car into their horse and buggy. We’re talking three years before the outbreak of World War I, when autos were still establishing their dominance on city and country roads. The sisters’ reward was a year-long siege of threats and violence from Henry Kaufman and his thugs. Told in Constance’s voice (1st person POV), we see her struggle with decisions about the safety of her sisters, especially her still teen-age sister, about farm finances, about whether and how she should help a mill-girl who’s another of Kaufman’s victims, about whether the system can be trusted to bring justice. Kopp’s persistence, courage and intelligence are key to helping Bergen County Sheriff Robert Heath bring Kaufman to justice. After the trial, Heath makes Kopp one of New Jersey’s first female police officers. Stewart’s creation of the personalities of the main characters, her development of the back story and sub-plot, her descriptions of the life style of three single women on a farm without electricity or gas*—all these draw the reader deftly and compellingly through the novel, even though we know the ultimate result from the beginning. *When the family bought the farm, a bit before 1900, electricity, gas, and paving had not yet reached Sicomac Road.